One of the ‘interesting’ things about a Windows Store application and the application lifecycle is that it forces architectural changes onto the way that you’d build an app. Custom background work implemented by tasks. Tasks are sparked up in response to triggers firing on the system. Triggers can be things like the user logging in or the network connectivity changing or something along those lines and a trigger can have conditions applied such that an additional check is placed on them before they run. For instance – the trigger “user present” might be given a condition of “internet available” so that it only fires in those circumstances. Some categories of trigger are available to be used by all apps and at all times, other categories are only available to an app that the user has put on their lock screen and a subset of triggers will only run if the user has their device plugged in rather than when they are running on the battery. On top of this, the work that a trigger can do is restricted in terms of CPU (time) usage and also in terms of the network bandwidth that it’s allowed to consume and, again, the network part of this changes depending on whether the device is powered or on battery. 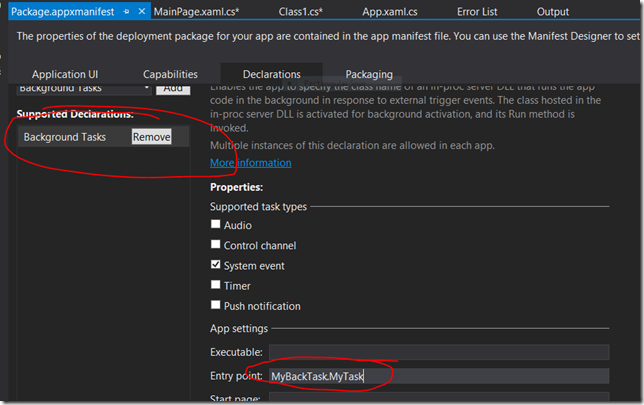 From a .NET perspective, a background task is a WinRT component that implements one interface with one method called Run. The application needs to register the tasks that it has along with the triggers that they are associated with and would usually do this the first time that it runs up. The application needs to take the right steps to ask the user to put the app onto the lock-screen if that’s something that the app’s triggers need to work and there’s guidance around that on the developer centre. There’s not, as far as I know, any way to register the app’s background tasks when the app is installed so if the app never got ran, I don’t think its background tasks could run. which is attempting to register the trigger when the NetworkStateChanges and limit that to only when the InternetAvailable flag is true. On line 6 of the code above, I use the MyBackTask WinRT component that I’ve added a reference to purely in order to be able to get hold of its type’s full name as part of the registration step. and then I can run my code to do the registration. What I found when using this particular trigger with my home office network is that the background task ran a lot. It tended to run almost as soon as I ran the registration code and it tended to run whether my network changed or not. I wanted it to run at most once when the network state went from “unavailable” to “available” and that really wasn’t happening for me. I think this is more than likely a “feature” of my machine or my networking setup but it definitely happens and it means that the trigger fires in situations where I wasn’t expecting it to. and (because of the way I’d written my code) I then uninstalled the app and reinstalled it to get rid of my background registrations. Using the InternetAvailable trigger seemed to give me a lot fewer ‘false positive’ results. That is – it didn’t seem to fire when my network state hadn’t changed from unavailable to available. However, it still did seem to fire more frequently than I’d hoped that it might – I could get multiple instances of the trigger running when my network state went unavailable->available. no doubt, also protect itself a little from the scenario where it gets an “InternetAvailable” trigger but perhaps the internet isn’t quite available when the task runs but maybe is available a few seconds later. There’s also another aspect of this. The IBackgroundTask interface Run method is passed an IBackgroundTaskInstance interface which has a Progress() method which the background task can use to report a uint value across the boundary to the foreground app. That progress value is picked up by the foreground app code getting hold of a BackgroundTaskRegistration object for one or more of its background tasks and then handling the Progress or Completed events provided by that registration object. A BackgroundTaskRegistration is returned when you register a task or when you get hold of existing registrations via BackgroundTaskRegistration.AllTasks. The ‘problem’ that causes for me is that the BackgroundTaskRegistration.Completed event will fire every time my background task runs, even if that’s not a ‘real’ execution of the task. The other ‘problem’ is that reporting an integer isn’t very verbose so it’s not easy to get real data back to the foreground task. It’d be nice to have something that solved those problems by only allowing the task to run so many times in a particular time period and facilitated the reporting of richer data between the background task and the foreground app whenever that background task completed. 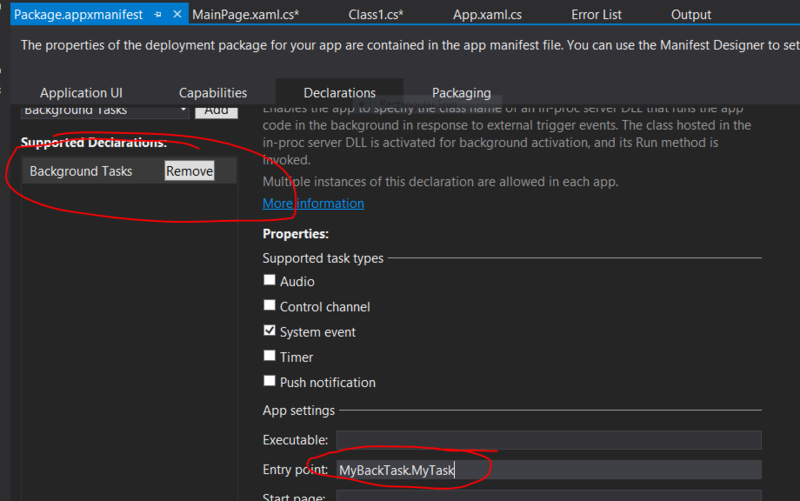 As far as I know, the background task doesn’t necessarily (or by default) run inside of the foreground app’s process so communication between the two needs to be via some out-of-band mechanism like maybe the file system or what I’ve experimented with is using the ApplicationData.LocalSettings property bag ( as documented here http://msdn.microsoft.com/en-us/library/windows/apps/windows.storage.applicationdata.localsettings.aspx ). Now, I’m sure this is a ‘hijacking’ of this particular piece of functionality but given that one of those settings can be up to 64K in size, I figure it could be used to report a serialized object from the background task to the foreground app and also to mark the point in time where the background task has last run successfully to avoid it running more frequently than I want it to. The following code’s pretty sketchy and largely untested but it’s what I made use of so far. // Going to throw if we can't find your task. // Something we're interested in. // that it is and my get/set on it certainly isn't. // Don't try and handle exceptions for you here. // event fires whether we really run the task or not.